Designing thoughtful, inspired and authentic living. It's all about YOU. Burns Century's gift is to ask, listen and absorb what is important to you. And then translate what she learns about your story through interiors, design and art. Photography by Jan Stittleburg of JSPhotoFX. From residences to hospitality and from living rooms to kitchens, both inside and out, Burns Century guides you from concept through construction to create extraordinary spaces. Asking many questions to start, she'll design holistically, effortlessly blending function, aesthetic and emotion. For individuals, she'll surround you with what you love and didn't know how to get there or even know existed. For businesses, she is expert at creating designs that invoke your brand to your clients. 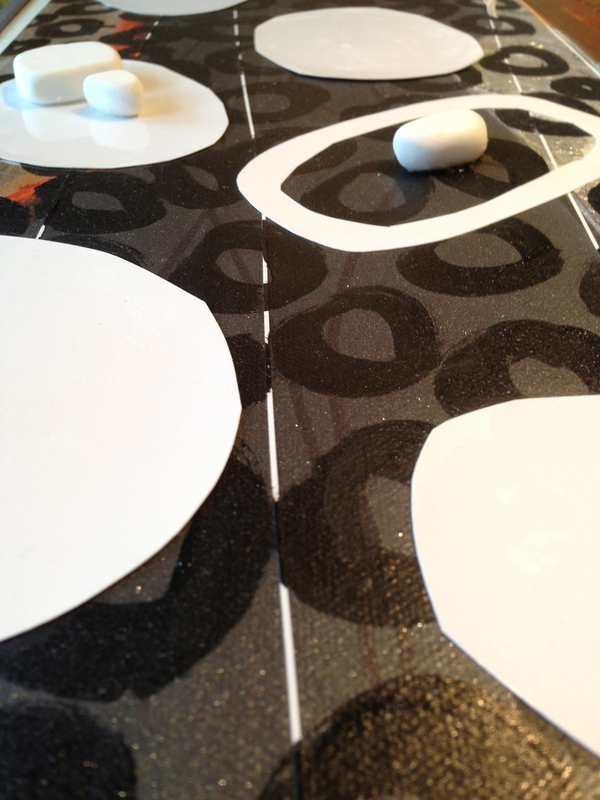 Custom product designs go hand in hand with interior design. Multi-material pieces are Burns Century's signature. Sculptural, artistic and functional elements coexisting beautifully. She designs everything from furniture to fire tables to bathroom fixtures to lighting and everything in between. "It's been said if a carpenter can build a door, then they can also build a wall. Same is true for design. Designers are designers are of everything - no limitations." 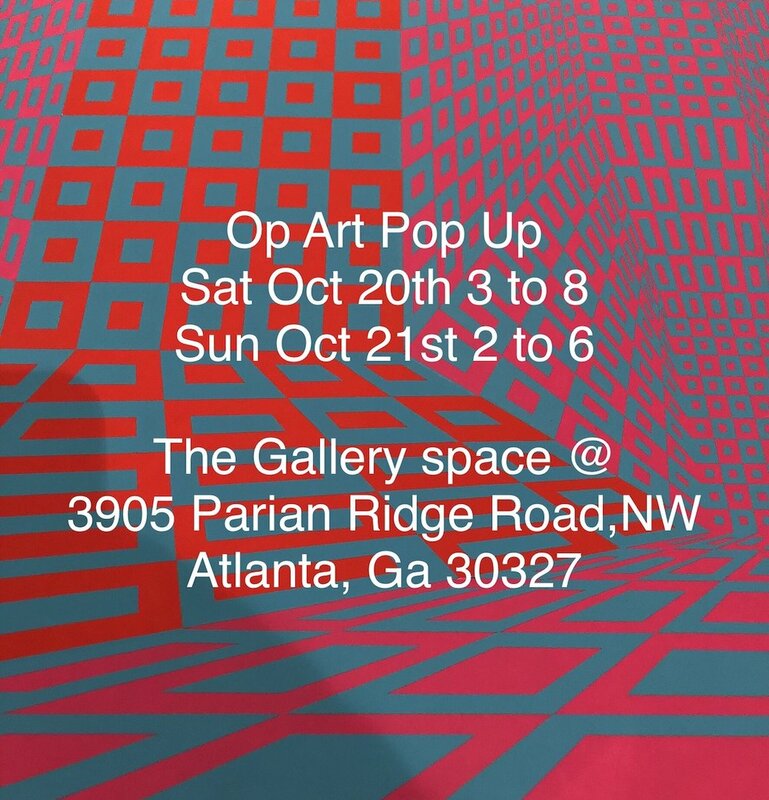 Click on image for more info on our upcoming Op Art Pop Up. Inspired by her interiors, readings and philosophies, Burns up cycles interior design samples and construction materials along with other art mediums creating original mixed-media fine art. For the past fourteen years, her pieces have been exclusive to her clients. Century Fourteen is a book published featuring these works. Her art is now available as giclees, art pendants and journals. for a repeat client with huge walk-in closet, spa bathroom and lounging bedroom envelopes them in a secluded retreat everyday. Recently featured in Trends Bathroom in an article entitled, "Puttin' on the Ritz". after building a new modern home, discovered Burns Century doing a google search. 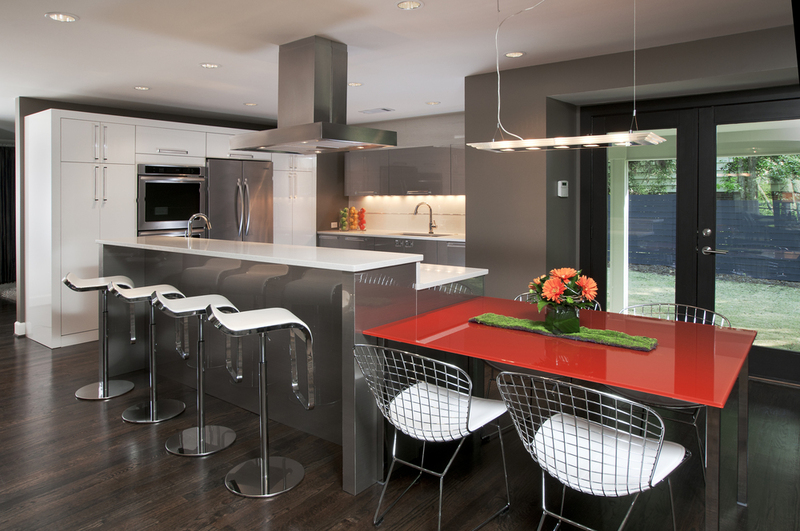 Staying true to the original intent of the architecture, bringing in the client's personalities and creating balanced, modern compositions to finish the spaces was key. 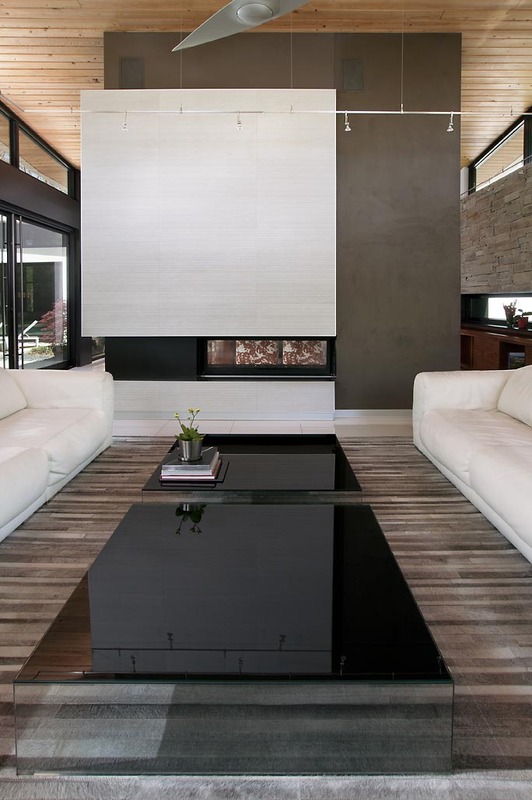 After initially consulting with them on the material selections for the fireplace using a combination of tile, steel and fabric wall covering, Burns continued by custom designing chairs for their existing dining, and furniture layouts and finishes for their study, game room and master. "Designing custom furniture allows us to reach exact scale, comfort and style that isn't available elsewhere. I designed these low lounger dining chairs, giving them exactly what they wanted - comfortable chairs for lingering conversations that make a statement. The faux steer hide is easy to clean and speaks to the client's roots of Texas in a graphic, modern sense." Creating a focal point through color blocking, Porcelanosa tile was selected in a grooved texture to compliment the linear orientation of the stone and the hard surfaces were softened by the suede wall covering from Innovations to add a contrasting energy and make the fireplace wall appear to float. The Big Bang light fixture was also highlighted against the dark suede where it was previously lost in the white sheetrock. Before the fireplace was an obstacle instead of a focal point. The Big Bang light fixture was also highlighted against the dark suede where it was previously lost in the white sheetrock. until the overall vision is realized. After previously remodeling the master suite and bedroom wing, completing the kitchen remodel, dining, living, front entry, office, pool and pool bath added the final jewels. this bathroom and bedroom was updated for a modernist couple. An emphasis on transfer of light from one space to the next, connecting with the outdoors and a palette of complimentary opposites brings an outdated bath into what's current and with a nod to Mid-Century. "We don't want to live in a museum, so taking the ideals of a period of design and applying them to what is available today allows us to be true to the period and still be modern and current today." with an atmosphere of an up-scale living room, but just outdoors. Being part of the cultural art district of the county, a dated outdoor patio area was given an artistic, high-end material composition with a layout that gives space for lounging, business collaborations, and dining bringing guests back for extended stays at the property. Whether they want individual space or group areas, business or personal, it has it all. Custom pergola with tv highlighted on a standing pebble wall, art canvas, wall sconces and floor lamps, custom fire table, sisal area rugs, seasonal pillows, multi-finish furniture -- all outdoor, contract rated but made to feel as an extension of an upscale, residential experience. A combination of natural elements of fire, water, metals, wood and lighting - nothing matching, but everything balancing - create a comfortable atmosphere both day and night.